The A.V. 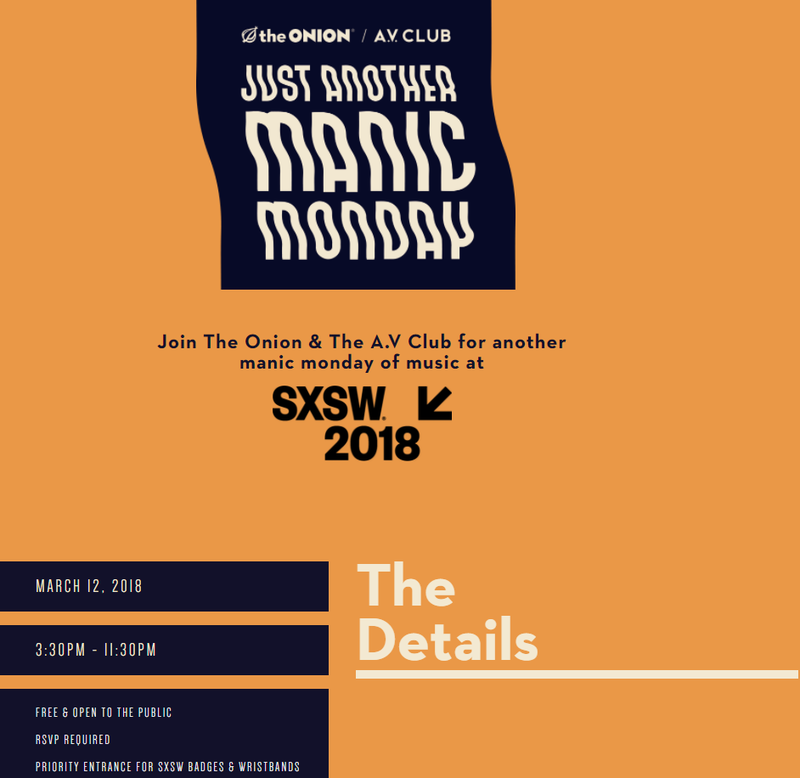 Club and their super funny buddies The Onion will be back in Austin this SXSW with their shindig “Just Another Manic Monday”. They have some of the biggest acts coming to SXSW this year including Wye Oak, Superchunk, Shamir, Bully, Lucy Dacus, Knox Fortune, Nnamdi Ogbonnaya, Lomelda, Sudan Archives, Field Report, Dramatic Lovers, and The Motor Tom. It’s going to be tough but try to bounce around between the indoor and outdoor stages for this dynamic lineup. Superchunk has been around forever and it will be really cool to see this band lay down some new tracks from their 11th studio album “What a Time to Be Alive” which was released February 16, 2018. Joining them on the main stage indie rock duo Wye Oak will soothe us with their dream pop. Make sure you RSVP with the link below! Be sure you RSVP on Splashthat here so that you can get in! Admission will be free and open to the public 21+ with SXSW wristbands and badgeholders receiving priority. This will be a huge event so show up early!